Joseph LeDoux‘s book, “Synaptic Self: How Our Brains Become Who We Are” opens with his recounting of an incidental glance at a t-shirt, “I don’t know, so maybe I’m not” (a play on Descartes’ “cogito ergo sum“) that prompted him to explore how our brain encodes memory and how that leads to our sense of self. More vividly, Elizabeth Wurtzel, in “Prozac Nation” recounts, “Nothing in my life ever seemed to fade away or take its rightful place among the pantheon of experiences that constituted my eighteen years. It was all still with me, the storage space in my brain crammed with vivid memories, packed and piled like photographs and old dresses in my grandmother’s bureau. I wasn’t just the madwoman in the attic — I was the attic itself. The past was all over me, all under me, all inside me.” Both authors, like many others, have shared their personal reflections on the fact that – to put it far less eloquently than LeDoux and Wurtzl – “we” or “you” are encoded in your memories, which are “saved” in the form of synaptic connections that strengthen and weaken and morph through age and experience. Furthermore, such synaptic connections and the myriad biochemical machinery that constitute them, are forever modulated by mood, motivation and your pharmacological concoction du jour. Well, given that my “self” or “who I think of as myself” or ” who I’m aware of at the moment writing this blog post” … you get the neuro-philosophical dilemma here … hangs ever so tenuously on the biochemical function of a bunch of tiny little proteins that make up my synaptic connections – perhaps I should get to know these little buggers a bit better. 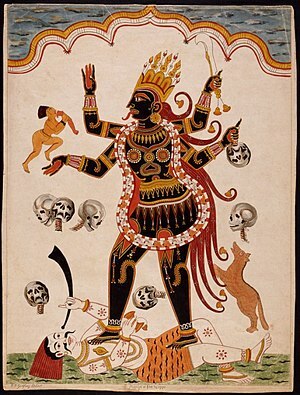 OK, how about a gene known as kalirin – which is named after the multiple-handed Hindu goddess Kali whose name, coincidentally, means “force of time (kala)” and is today considered the goddess of time and change (whoa, very fitting for a memory gene huh?). The imaginative biochemists who dubbed kalirin recognized that the protein was multi-handed and able to interact with lots of other proteins. In biochemical terms, kalirin is known as a “guanine nucleotide exchange factor” – basically, just a helper protein who helps to activate someone known as a Rho GTPase (by helping to exchange the spent GDP for a new, energy-laden GTP) who can then use the GTP to induce changes in neuronal shape through effects on the actin cytoskeleton. Thus, kalirin, by performing its GDP-GTP exchange function, helps the actin cytoskeleton to grow. The video below, shows how the actin cytoskeleton grows and contracts – very dynamically – in dendrites that carry synaptic spines – whose connectivity is the very essence of “self”. Indeed, there is a lot of continuing action at the level of the synapse and its connection to other synapses, and kalirin is just one of many proteins that work in this dynamic, ever-changing biochemical reaction that makes up our synaptic connections. In their paper”Kalirin regulates cortical spine morphogenesis and disease-related behavioral phenotypes” [doi: 10.1073/pnas.0904636106] Michael Cahill and colleagues put this biochemical model of kalirin to the test, by examining a mouse whose version of kalirin has been inactivated. Although the mice born with this inactivated form are able to live, eat and breed, they do have significantly less dense patterns of dendritic spines in layer V of the frontal cortex (not in the hippocampus however, even though kalirin is expressed there). Amazingly, the deficits in spine density could be rescued by subsequent over-expression of kalirin! Hmm, perhaps a kalirin medication in the future? Further behavior analyses revealed deficits in memory that are dependent on the frontal cortex (working memory) but not hippocampus (reference memory) which seems consistent with the synaptic spine density findings. Lastly, the authors point out that human kalirin gene expression and variation has been associated with several neuro-psychiatric conditions such as schizophrenia, ADHD and Alzheimer’s Disease. All of these disorders are particularly cruel in the way they can deprive a person of their own self-perception, self-identity and dignity. It seems that kalirin is a goddess I plan on getting to know better. I hope she treats “me” well in the years to come.